It seems to garner more controversy in the US, though I have had some interesting chats with baptists here in Australia too. Firstly, I would say I am an advocate of the normative principle over the regulative principle. That is to say, if the Bible doesn’t prohibit something, generally I might be comfortable in doing it. 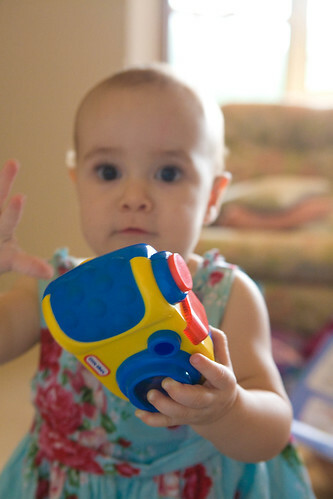 The Bible doesn’t cover what it means to baptise children, and I think it is a reasonable thing to do, so away I go. Secondly, I think there is a sense of community that we see in the Bible that we have lost in the modern day world. In the first instance you have the patriarchs of families declaring their whole family Christian & then being baptised in the Bible. Secondly, there is an expectation that the children of a person will be brought up in the tradition of their parents. 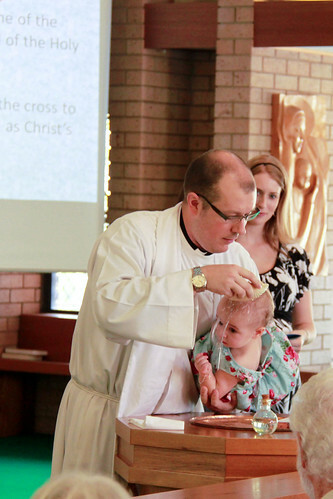 Baptism for me is an expression that the child is mine, will be brought up as a Christian. Pumpkin may make a decision to go another way when she is an adult, but that is no different than any other adult who has been baptised who then choose another path. Of course, it is also a tradition of the Anglican church & has been a traditional practice of the church as a whole for at least a millenium & most likely a fair bit more! Anyway, I know most of my readers are more interested in the pictures (if you haven’t already seen them on facebook) so here they are! 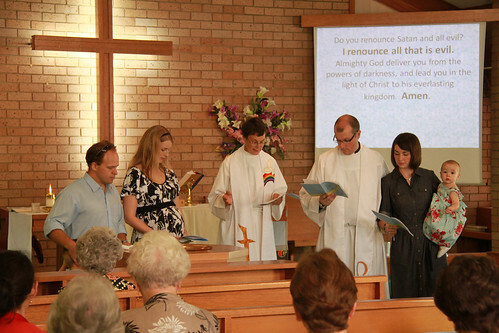 Here we are making promises about our faith & how we intend to bring up our bub. From left to right it is Matty, Simone, Rosemary, Me, Shona & the Pumpkin. Splash and Dash? I’d be just as happy with full emersion. Happy to baptise this way too! 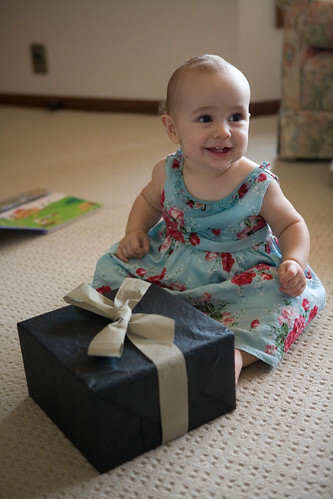 Here is the pumpkin about to open a present from her Aunty Bec. 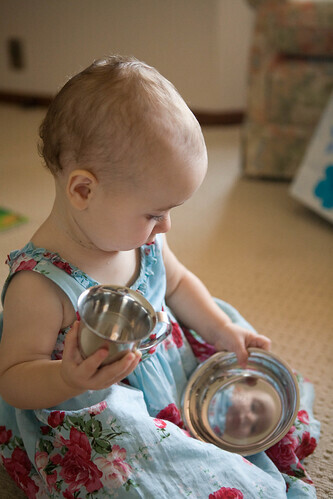 I was really happy with this pic, but have to admit that it was a fluke to have her face reflected in the bowl. 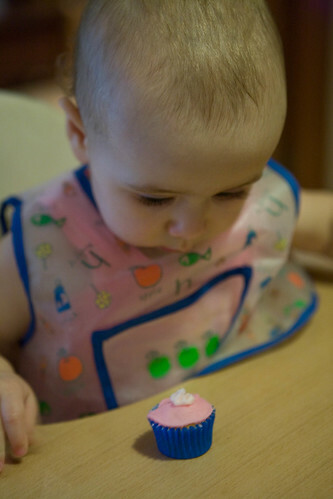 Pumpkin’s concentration on her very first sugary delight is topped only by her enthusiasm in the following picture. Absolutely gorgeous Tim. I wish we could have been there. Bryan Chapell’s Why Do We Baptize Infants is a good book to explain the biblical principles of infant baptism.